Alan Gottlieb, founding partner, is a 1967 Graduate of The Penn State University Smeal College of Business Administration with a B.S. in Accounting and a 1971 Graduate of Rutgers Law School in Newark, New Jersey. He was employed by Price, Waterhouse (now, Price, Waterhouse, Coopers) and Arthur Young & Company, (now Ernst & Young & Company), which helped round out his business acumen before entering the private practice of law in 1972. 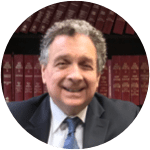 He has over 45 years experience in Residential and Commercial Real Estate matters, Business, Commercial, and Family Law, including Divorce and Custody matters. His experience also includes Debtors and Creditors rights, and Bankruptcy matters. He is a member of the New Jersey & United States Supreme Court Bars and an inactive member of the New York Bar. He is a member of the Middlesex County Bar Association and the Trial Lawyers Association of Middlesex County.